Make this fabulous open-plan home your adventure base for all seasons in the Tongariro National Park. It captures the sun to a treat and gives you great mountain views both upstairs and downstairs. 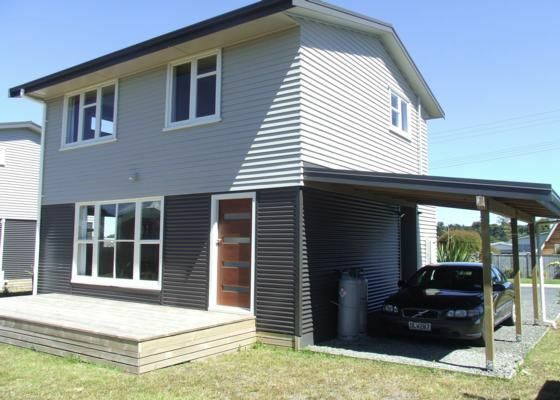 Modern furniture, appliances and decor make this just about the nicest house in the village to come back to after a day full of skiing, tramping, mountain biking or paddling. With a large LED TV, bluray player and free wifi, plus a selection of board games and books, your entertainment is sorted too. It’s not too big for a couple, but it’s also ideal for a family and can sleep as many as six people in three bedrooms. The house has undercover parking, and a separate laundry/drying room for hiking and ski gear. There is a separate bathroom and toilet upstairs, and an efficient heatpump downstairs that will have it cosy and ready for your arrival on a Winter’s evening. National Park Village offers great places to eat, transport to all activities, often with door to door pick up, hiking and ski hire facilities, a petrol station and a Four Square. Kayaking, rafting, fishing and mountain biking adventures are all at your fingertips. Nice Stay - House is as shown in photos. Good heat pump. This house was perfect for two couples: we used the third bedroom as a giant closet so we didn't have to fully unpack our suitcases. The living and dining areas were sunny, we were able to cook a pizza (from scratch) in the kitchen, and the beds were comfortable. This was an awesome spot to stay for our National Park adventure. The house was perfect and the hosts, Louis and Marina, were fabulous. Great place that ticked all the boxes. Located in National Park Village, the property is the perfect base to discover the iconic Tongariro National Park. Home to three majestic volcanic peaks - Tongariro, Ngauruhoe and Raupehu, Tongariro National Park was first national park created in New Zealand and is the fourth oldest in the world. Tongariro National Park is a dual UNESCO World Heritage area - recognised for both its cultural and natural significance. The park offers walks and hikes to suit all levels, including the world-famous Tongariro Alpine Crossing - which starts just 20 minutes from the house. In winter, enjoy the unique experience of skiing, snowboarding or playing in the snow on an active volcano - Mt Ruapehu.